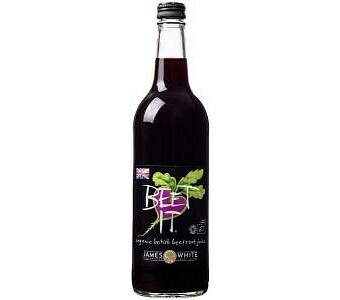 Beet It Organic Beetroot Juice is blended with 10% fresh apple juice to bring you a delicious and refreshing drink that is extremely good for you. Beetroot is known for containing high concentrations of dietary nitrates which increases nitric oxide in the body and helps aid high blood pressure and gives you strength. So drinking Beet It Organic Beetroot Juice has great health benefits as it helps decrease high blood pressure and is perfect for drinking after taking part in strenuous physical activities such as that sweaty work out at the gym and even that hilly bike ride trail. Certified organically grown Not from concentrate Free from preservatives and additives Great source of natural dietary nitrate Ingredients: Organic beetroot juice (90%), organic apple juice (10%).